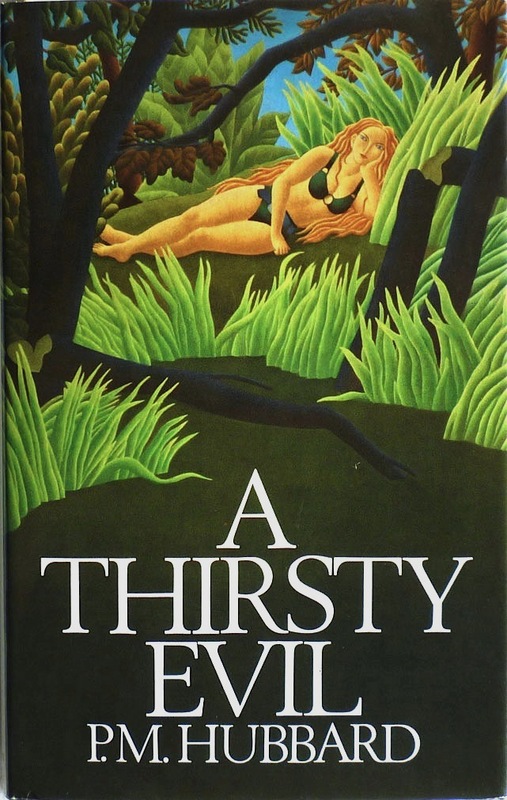 This is the British first edition of cult suspense novelist P. M. Hubbard's A Thirsty Evil, published by Macmillan in 1974. Now, those of you with reasonable memories might recall my having blogged about this book before, albeit in a different edition: a 1974 US Atheneum first edition, to be precise, signed by P. M. Hubbard and inscribed to his friend, the author Alan Kennington, making it the only signed Hubbard book I've ever seen. 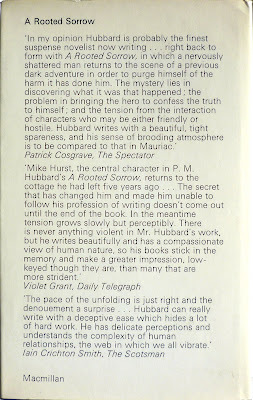 That copy of the book came with its own remarkable bit of ephemera: a signed, handwritten letter by Hubbard to Kennington about the novel, which, one might reason, together with the signed edition would be quite enough for any Hubbard enthusiast. But I later spotted this Macmillan edition online and then went to take a look at it at the seller's bookshop, and simply couldn't resist it and the ephemera that was stapled to its front free endpaper. I'll return to that in a moment, but first, the novel itself. 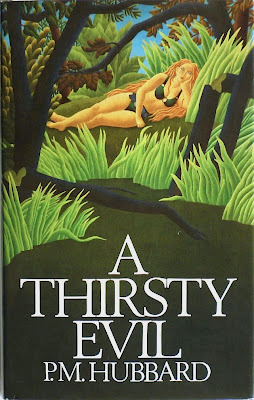 As is often the way with the books I buy, I hadn't read A Thirsty Evil when I originally wrote about it, but I have since, and it is, as the late Wyatt James dryly notes in his annotated bibliography, "a characteristic book by this author". It certainly reminded me of Hubbard's clammy masterpiece A Hive of Glass (1965), although A Thirsty Evil isn't quite of that calibre; overall it's less oppressive, though still with that intensifying aura of dread, the juxtaposition of a rural idyll – in this case centred on a remote pool hiding a submerged, totemic tooth-like stone – with a sense of there being something very wrong in this summer sun-drenched English backwater. Hubbard's protagonists are often unpleasant fellows, and the narrator of this one, novelist (and heir to a biscuit empire) Ian Mackellar, is a man who is, at root, as feckless as his nemesis, Charlie, the mentally disturbed brother of Julia, the woman Mackellar is obsessed with; it's evident early on that matters won't end well, and so it proves. 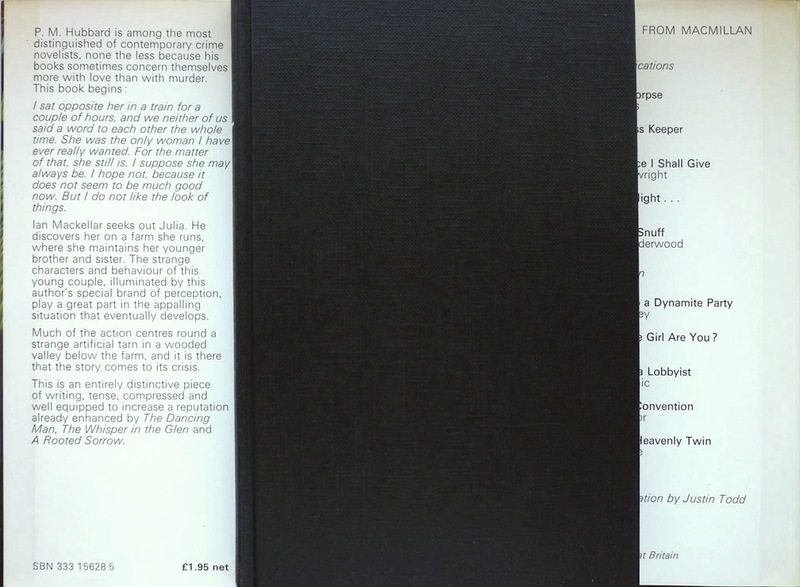 But the getting there is grotesquely gripping – the tense scenes where Mackellar encounters Charlie and Julia's other sister, Beth, are especially memorable – and both Wyatt James, who labelled the book "not outstanding", and indeed Hubbard himself, who, in his letter to Kennington about the book, stated, "it's not one I'm very keen on myself", were, I think, doing A Thirsty Evil a disservice: it's a short, taut, unnerving little triumph. Maclean's memo is apparently a response to a note from Harold Macmillan, who was evidently far from keen on Justin Todd's Henri Rousseau-esque jacket artwork for A Thirsty Evil. Maclean's defence of the design choice runs thus: "All the jackets for [Macmillan editor] George Hardinge's list are aimed particularly at the 'thriller' market, and this one has been very well received in the trade. The Australian company ordered 250 copies on the strength of the jacket alone!" After reasoning that the illustration "is not entirely irrelevant", Maclean signs off by saying that he's returning Macmillan's own copy of the book – presumably the very copy seen in this post. And then, at the bottom of the memo, comes something quite extraordinary: a handwritten note by Harold Macmillan, signed "HM", with a "thank you" to Maclean, followed by the exclamation, "Oh God! Oh Montreal!" On first inspection those words might appear slightly baffling – they did to me, anyway – but it's actually a reference to English novelist and satirist Samuel Butler's "A Psalm of Montreal", a commentary on what Butler perceived as the Canadian propensity to embrace financial matters above artistic ones, as embodied by the fate of a plaster cast of the classical Greek sculpture Discobolus (epitome, appropriately enough in the wake of London 2012, of the Olympic spirit) on the premises of the Montreal Natural History Society. Essentially, Macmillan was bewailing the justification of what he thought was a rubbish cover by the book's advance sales. As remarkable as this document is, there are a couple of things about it which, to my mind, make it even more so. For one, Harold Macmillan clearly read and enjoyed A Thirsty Evil, which strikes me as being, at the very least, notable: a former prime minister was a "fan" of P. M. Hubbard (there's one for the blurbs on the forthcoming Murder Room ebook reissues of Hubbard's novels). 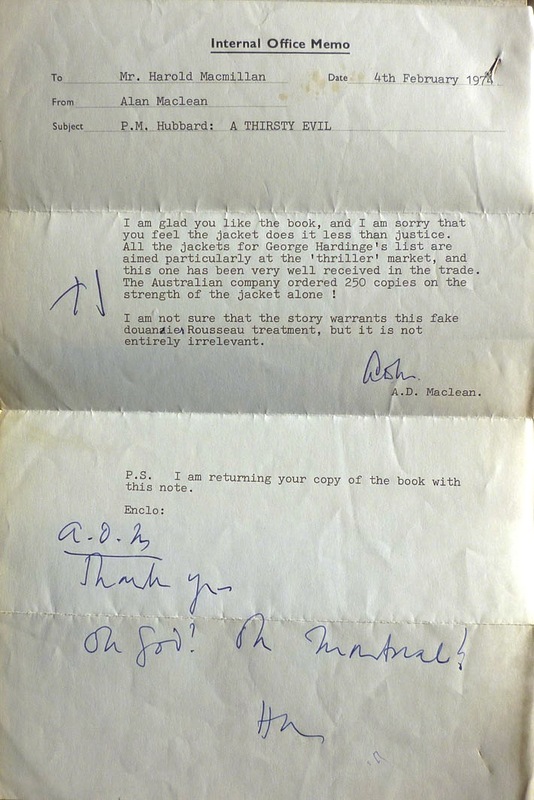 For another – and this is priceless – it looks to me as if Macmillan actually corrected Maclean's original note when he acknowledged receipt! Maclean misspelt "douanier" – as in Le Douanier, Henri Rousseau's nickname – as "douanaie", which Macmillan – it appears to be in his hand and his slightly darker blue pen, not Maclean's – has in turn amended, crossing out the additional "a" and adding an "r" at the end! To be honest, I'm not sure if the bookseller I bought this from quite knew what he had on his hands – I paid a fair amount for it, but not much more than you'd have to pay for a decent Macmillan first edition of A Thirsty Evil anyway (like most of Hubbard's novels, it's become quite quite uncommon in first). In any case, I shall treasure this just as much as my signed Atheneum edition and accompanying Hubbard letter – and as a bonus, you all get to see it as well. I was impressed when you started acquiring some original cover art for certain books but this acquisition is an even greater trophy. Well done. I confess that I did not know Macmillian the PM had anything to do with Macmillan the publisher. Did Macmillan make any marks in your copy of the book? Great detective work on your part filling out all the details of that note. Thank you, Brian. I was hoping you'd dig this one. No marks from Macmillan in the book I'm afraid – it's possible this copy went back to Maclean and Macmillan didn't keep it after all. But I was pretty pleased with what I managed to work out from the info in the memo. I think I'm missing five Hubbard novels now – a couple more turned up in just the last few days, including a first of your first Hubbard – although I'm still on the hunt for a first of one I already have. He's becoming very hard to collect now; interest in him seems to be rising, hence his imminent return to print. As for original cover art, I have a couple more things along those lines waiting in the wings – not Hubbard, but other authors I've written about – which I should get to within weeks. Brilliant. I never knew the SuperMac/Macmillan connection either. I once had a copy of Peter Cushing's second memoir The Hammer Years, signed by Cushing to John Dunn, the Radio 2 DJ (Cushing had evidently been a guest on his show when the book came out). The great man didn't stop at signing it though. He went through the book and corrected, in his lovely elegant handwriting, several typos he'd noticed. I don't have that book any more, sadly. I sold it to a man in a pub for £50 when I was raising sponsorship for a charity thing I was doing. I really wish I hadn't now. I'm not sure the seller of this book knew of the Supermac/Macmillan connection either, Adam; I didn't when I bought it. I assumed the Harold Macmillan of the memo simply had the same name as the former prime minister – until I did some digging, and realised he was one and the same. And the style and the "HM" matches other examples of his handwriting I've seen online, so I'm as certain of its authenticity as I can be. Ooh, bummer about selling that Cushing book. That sounds like a cracker. 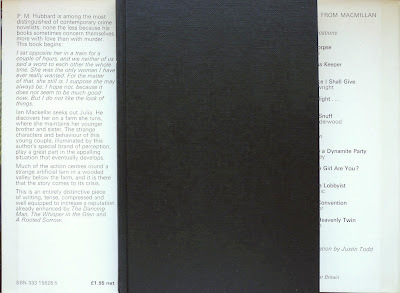 Similar to – although rather more special than – that copy of Ross Thomas's The Mordida Man corrected by a Penguin editor I blogged about a while back. I am not aware of any other well-regarded crime writer who “dropped off the edge” so totally and so quickly after his death. 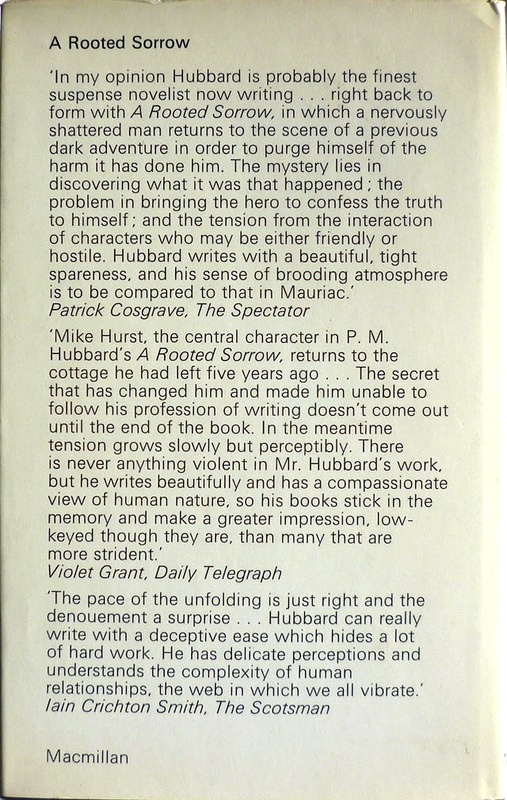 In 1989 I met the new (then) Crime Editor at Macmillan and told her I was in the process of acquiring P.M. Hubbard’s complete works thanks to libraries selling them off! She looked bemused and admitted she’d never heard of Hubbard. In 2009 when we started Top Notch Thrillers, Hubbard was at the top of my shopping list. The agent for his estate demanded ridiculous terms (not huge money, just silly little conditions) which made a nonsense of our business plan (which was acceptable to living authors such as Alan Williams and Christopher NIcole as well a the estates of Geoffrey Household, Duncan Kyle, etc.) and obviously preferred the books to stay out of print (as some had for over 30 years). I always regard Hubbard as “the one that got away”. That does happen a lot, though--writers who were prolific, whose book sold strongly, and were well-reviewed, and in some cases adapted into successful movies--they just disappear from the public mind. And conversely, authors people barely heard of when they were alive (or were only published posthumously) can become far more famous after death. Still, everybody says they want immortality, but given the choice between being successful and lauded when alive then forgotten after you die, or being poor and ignored in life then having a few of your works read for as long as there are people to read them--which would you choose? Mike: Hubbard won't be the one that got away for much longer: looks like there'll be ebook reissues of many of his novels appearing in early September and paperback early next year. Chris: all true, and excavating forgotten authors is a large part of what this blog's all about. By the way, you should try Hubbard (if you haven't already). I think you'll like him.